As a teacher and a life-long reader, I have come up with ten ways to encourage your child to enjoy reading. Even if you are not a habitual reader yourself — Are you saying you don’t have time? — these are simple ways to instill the habit of reading in your child. She will do better in school and develop a lifetime habit that will stimulate her mind and provide hours of entertainment, imaginative play and learning. Read yourself. Always have a book going, even if it takes you months to finish it. Let your child see you reading. Visit the library. Even a pre-schooler can pick out book that appeal to her or him. And it’s free! Limit TV and computer time. Do NOT use them as babysitters. Any kind of technology is a merely a tool. Supervise these activities closely to see if it is really what you want for your child. Make learning to read play, not a chore – find sight words when you are out. Words are all over our environment. 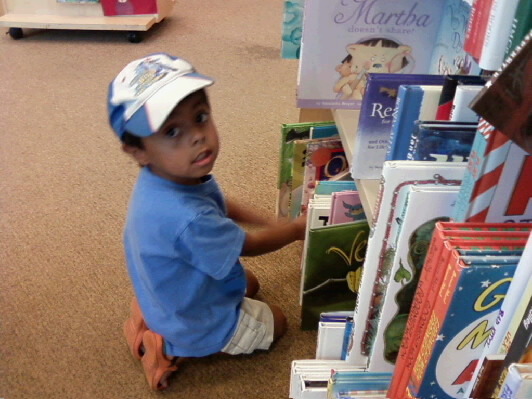 A beginning reader can have fun finding sight words on a trip to a store or driving down a highway. Have books in your home. As popular as e-books are now, there is something special about picking up a book and leafing through the pages. Stock your shelves with reference books and old favorites. Explore used book shops and the bargain shelves at large book stores it you need to add to your collection. Reread old favorites from your childhood. Remember Where the Wild Things Are, The Wind in the Willows, Charlotte’s Web? Go to plays – not always movies. The actors can make more of a connection since they are clearly “regular people” playing parts. Read the books that your child’s favorite movies are based upon. It’s helps them be aware that in many cases, the book was written first. Talk about ideas. Ask your child what he thinks? Listen to what he says and offer a neutral comment. If he asks you what you think, tell him. But add that it is your opinion, and everyone has a different opinion. Respect your child’s thoughts.